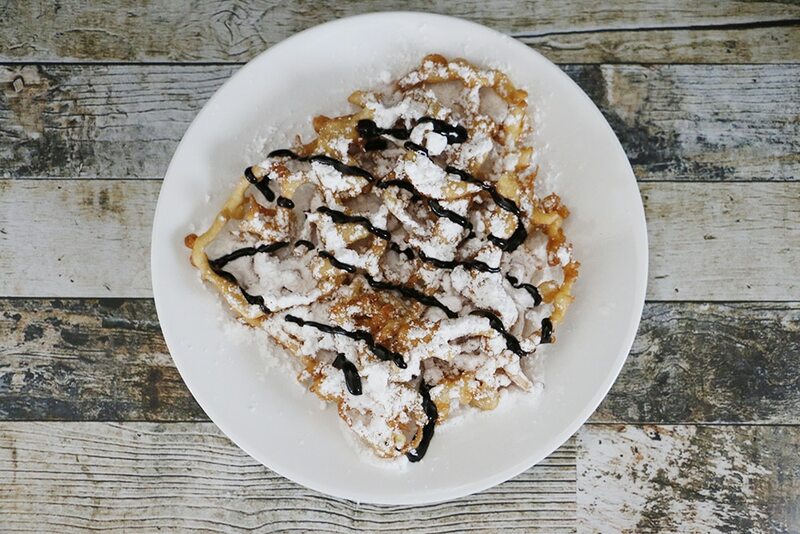 This simple funnel cake recipe will make sure that you never miss carnival funnel cakes! You’ll feel like you were at the fair every time you make these! It’s February. And the Winter blues have taken over like whoa. I’m so ready for Spring + Summer! I am itching to open up some windows, listen to the birds chirp and be able to go outside without spending twenty minutes trying to bundle up enough. But I have the perfect solution today: carnival funnel cakes. You know those things that remind you of special moments in your life? Certain songs, smells, foods, etc? Carnival funnel cakes are probably one of my top memory triggers. We got engaged on the Santa Monica Pier and afterwards enjoyed a strawberry topped funnel cake. To this day, the sight and smell of carnival funnel cakes brings me back to that day. 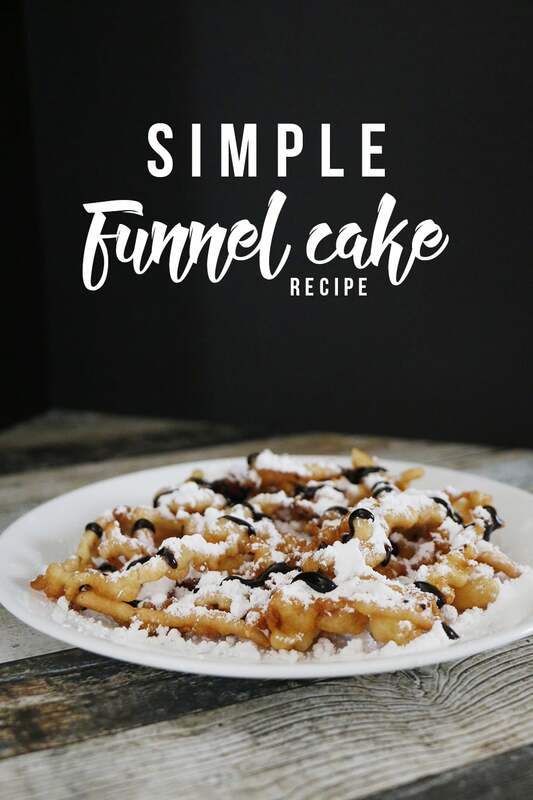 So today, I want to share this simple funnel cake recipe with you! Whether or not you have a sweet memory of carnival funnel cakes like I do or not, these are a must-make! Whether it’s now so you can beat the Winter blues or in the Summer when the fair is in full swing – enjoying funnel cakes in your own home with your favorite toppings is so much more fun! I’ll admit I was really hesitant to try making funnel cakes at home. I thought that they would be really, really, really hard. With how much they charge at a carnival for them, how couldn’t they be? Funnel cakes are ridiculously easy. (And potentially messy if you’re not careful, hint hint.) 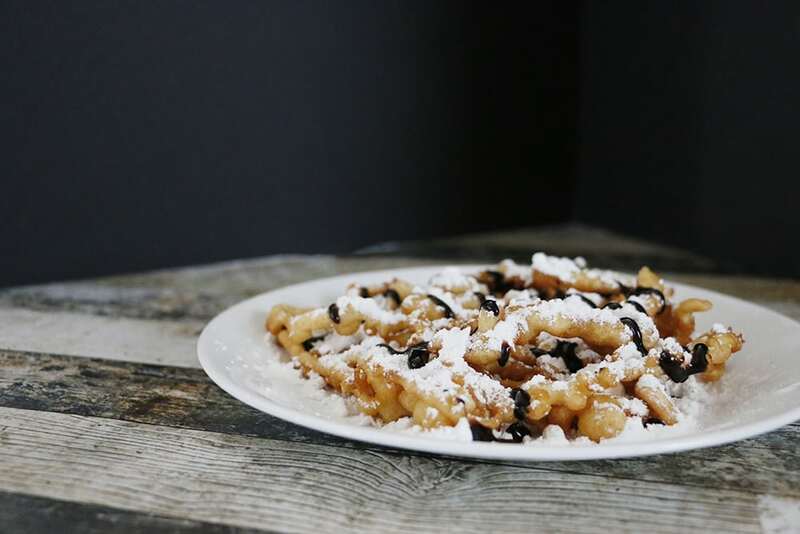 And this simple funnel cake recipe will make sure you never have to pay the crazy price for them at the fair, especially when you’re a topping fan. Preheat your deep fryer or pan of oil to 375F. Beat the eggs. Add in the milk, sugar and vanilla. Mix until combined. Slowly combine the egg mixture with the dry ingredients, mixing as you go. Using a 1/3 cup, pour the mixture into the fryer or pan in a circular pattern to form the shape of the funnel cake. Fry for 1-2 minutes per side, or until golden brown. Sprinkle with powdered sugar or your favorite topping(s) and enjoy! This week’s Maker’s Mix-Up Theme is carnival! I’d love to see what you have in store for us with fun carnival recipes or DIY! Want to start thinking about next month? Here are the March Themes for Maker’s Mix-Up! 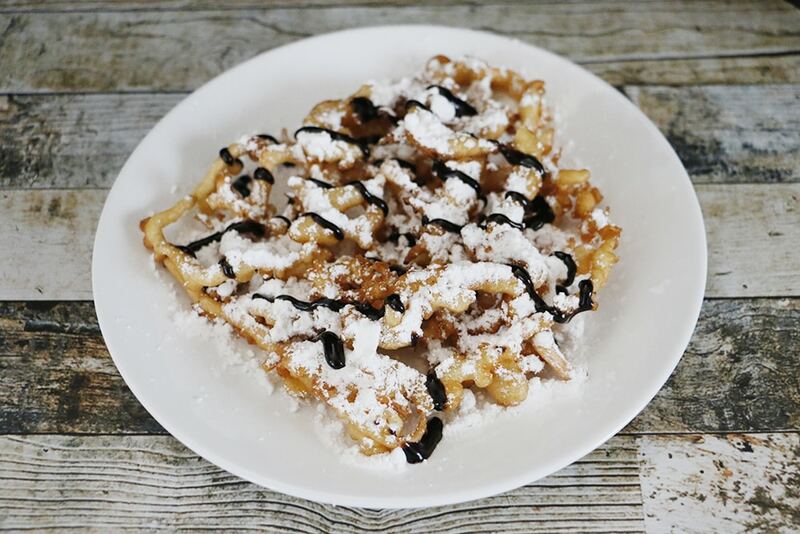 what is your favorite topping for carnival funnel cakes? My husband has such a sweet tooth and this looks amazing!! I will have to try it! This looks delicious and your photos are beautiful! Oh my gooooooodness. I’m gonna blame it ona pregnancy craving….but this momma is gonna give this recipe a go tonight! OMG!!! Funnel cakes are my absolute favorite!!! In fact I only go to county fairs to get a funnel cake. Thank you for this! Umm… yummy!! That needs to get in my belly right now! 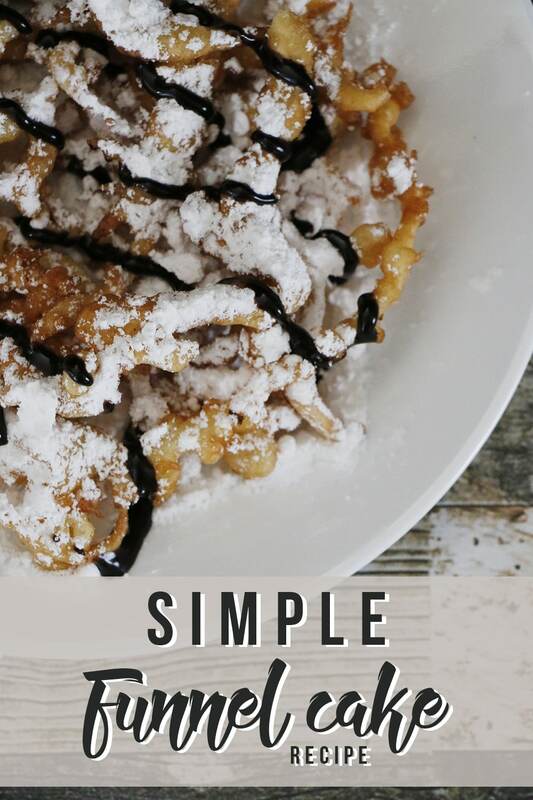 I like it simple…powered sugar on a hot funnel cake. Yum! I can never make up my mind! Simple works some days, then I want ALL the toppings! Funnel things are probably my most favorite thing in the world – I count myself lucky that I can usually only have them once or twice a year, haha! These look lovely! Thanks for stopping by Throwback Thursday! We can’t wait to see what you’ll have for us next week! Stopping by from Sunday’s Best Linkup. Thanks for joining the party. I laughed when I saw your post, I’ve been looking for a Funnel Cake Recipe. My grandson loves it. One of my favorite memories is of him eating it for the first time. It was love at first sight. 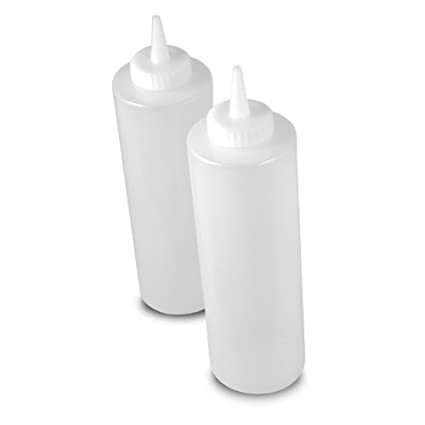 I just purchased the condiment bottles from Amazon. 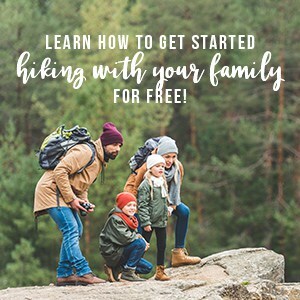 I’ll be Tweeting and Pinning your linkup. Hope to see you again. Sorry about the wrong note to you! lol Just delete it. Love your funnel cake recipe!! Pinned & shared.Thanks for joining the Inspiration Spotlight party! Hope to see you again soon. This is so fun..looks just about perfect for a night in , cosy in the bed, having a fling with Netflix and this deliciousness right here. Thanks for joining us at #SaucySaturday.. Pinned of course! Reminds me of a summer carnival! Thanks for sharing on the What’s for Dinner party! Oh My GOODNESS. This is just what I needed. Funnel Cake. Thank you so much. My waist line will hate you but my mouth will continue to sing your praises. Who doesn’t love funnel cakes? Thanks for sharing with us at Throwback Thursday! Pinned and shared. funnel cakes are always the one thing I get at a fair!! Thanks for sharing with us at Throwback Thursday!! Hi Ashley, lovely cake, hope you’ll bring this on over to Food on Friday: Cakes over at my house (Carole’s Chatter)!